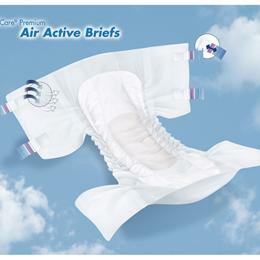 Air Active Disposable Briefs: Every Inch Of This Brief Is Breathable For The Ultimate In Comfort And Skin Care. Large Leg Openings Ensure The Most Accurate Sizing And Comfort. Features An Advanced 3-Part Core (With Curly Fiber To Help Maintain Skin Neutral Ph) For Superior Dryness, Odor Control And Skin Care. Anti-Leak Leg Cuffs Provide Superior Leak Protection. The Stretchable And Refastenable Comfort-Fit 2-Piece Tape System Offers Improved Fit And Comfort. Small, 24" - 35".